While yesterday I had my friend over and it was just us two on bikes, today my boyfriend's mom and stepdad came up to visit and it was great to finally have 4 bicycles! We actually saw a lot of bicycles and more parking spots popping up in CityPlace so that was a pleasant discovery. They really like the area because its a big city without the big city problems and its landscaped so beautifully and so friendly to non-car users that it made them resent living where the closest thing they can walk to is a stand selling chicharrones down in Kendall. They have to drive for everything else. And it's the same case with all suburb areas, especially around Miami and even in Port St. Lucie where Dasha is from and where my parents still live. You can't walk anywhere and nobody is ever outside. If they are outside, maybe they're burglars. When I was in school there, there weren't even sidewalks and so either I rode in the street or I had to ride on the grassy shoulders. I had a mountain bike and at least it made sense and had a purpose but it was so annoying. You really get what you pay for if you choose to subsidize the cost of living with the surrounding area. Most of your monthly expenses will be car-related. Or you can pay a higher up-front cost but then reap the long-term benefits. I find it heartening and warming that I am seeing more and more people on bicycles around here and cars travel nice and slow and are used to seeing them. When you see not only lots of pedestrians walking around but families riding around on bikes, you know your city has achieved something great in terms of urban livability and building for the people. The cars can be an afterthought. And for this very reason, it's great to have bikes for your guests and not have to worry about touring transportation. It's fun, it's pleasant, and it's just simply convenient and easy. Showing my friend Dasha the town! She borrowed the Amsterdam and off we went. It's great to have bikes for guests since there really is no better way to explore around here than like this. We can sneak through anywhere, discover cool things along the trail, stop for photoshoots, and no parking problems! We encountered a fox on the Breakers golf course! I finally managed to make it out to a ride organized by a bicycle group here in West Palm that's solely for the ladies. I've been meaning to for the past couple of months but there's always something. I met a few very lovely ladies on their bicycles and we meandered our way to the beach and ended up at a dive bar finally. It was great to finally come out and meet other cyclists and make some new friends. Hopefully I will become more of a regular from now on. This ride meets Tuesday nights at the Carvel south of Southern Blvd so it's a good way to spend a weekday evening, especially if it includes beer. Sorry for the poor picture quality! I'll end the post with this photo of some cycle chic at any age! 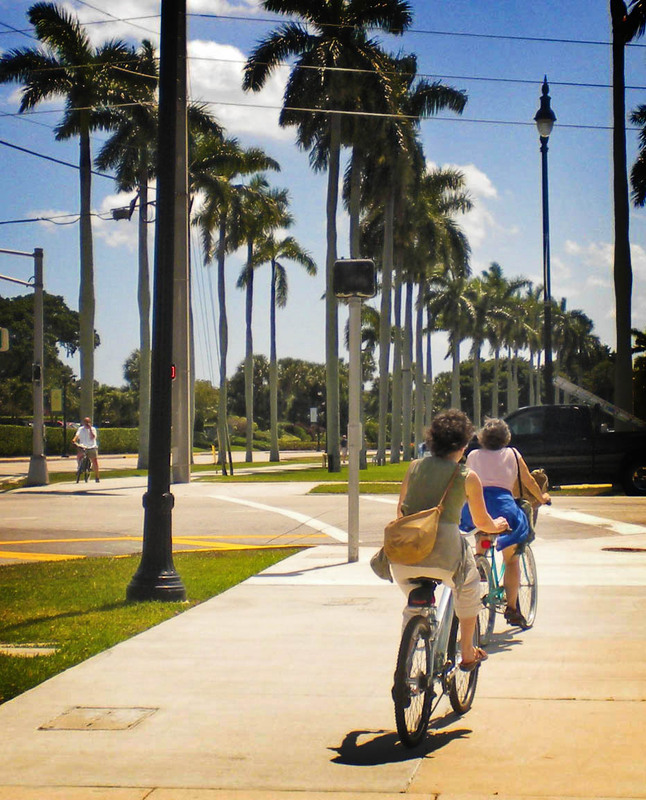 These ladies are on the Palm Beach Trail, a scenic paved trail along the Island for pedestrians and bicyclists. This weekend was a mash of events: the boyfriend's birthday, our one year anniversary, and Father's Day. We have one more addition to our growing garage and the growing Palm Beach Dutch Bikes gang: a new (to him) Electra Amsterdam Classic 3i with a diamond frame bar. It was my crazy surprise gift for him. The hassle I went through with the local bike shops is made worth it by his sheer happiness so it's all good. Suffice to say bike shops around here do not like dynamo light systems and really have no skills at electronics whatsoever, hence none at fixing what ended up being a minor problem. The front light didn't work and eventually it was resolved to be a simple wire replacement. This was resolved after the Palm Beach Trails bike shop gave up on it and I trekked it, front wheel hanging out the trunk of my Mustang, across town to a shop that I should have gone to in the first place. In the process of trying to find a shop that actually knew something about dynamos, I found a gem right here. A gem I thought was only in Fort Lauderdale at Chubb's Bikes. Both places are like holes in the wall that repair and sell with very very fair prices used but loved and reliable bicycles. This place is called BackYard Dog Bicycles and it's on Forest Hill Blvd and Military Trail, next to the Bodegon and some Flea Market place. The guy Mel used to build Harleys and can apparently fix anything. He was so friendly and nice and tried his best to help me to help Palm Beach Trails shop figure out how to fix the dynamo. 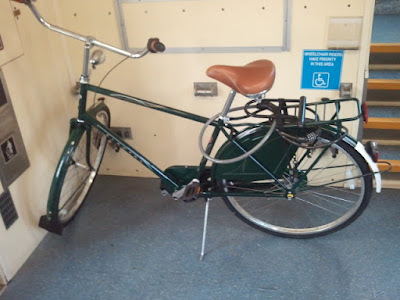 The other day I came by, someone even dropped off a folding Raleigh bike! He even has some old tandems for awesome prices. My Peugeot has been having some issues so I was going to one day bring it by, not only to show him but have him look at it and give him some business. He kindly refunded me when we realized the dynamo did not need to be replaced. I told him there is definitely need of bike shops and repairmen like him here in downtown. Even just by renting some out he could recoup the investment to move there. For now though, their location is good because he is able to make affordable and available reliable bicycles to the people there who can't afford much. The Electra Amsterdam is a solid bike. It's more of a Dutch "Style" Replica produced by an American brand. It is much lighter than my Gazelle but it has what we think are mostly the essentials and it rides like a Cadillac as well. He described it as being more agile but less stable than the Gazelle. I have not ridden it so I don't know. He's definitely able to pick up speed way quicker than me. We had a race late at night down Flagler where I got up to speed 7 and we were neck in neck tied. The Amsterdam has 3 speeds and only has coaster brakes. It has fenders, a rear rack, coat guards on the rear wheel, full chainguard and a mudflap on the front fender. The front wheel has a bottle generator that powers the headlight only. The rear light is battery operated and attached to the fender. His fender also has the signature "white cotton tail" of the European bicycles. The rear rack also has the bungee straps on it. It comes with a bell (that I polished with steel wool to get rid of the rust) and the Shrader valve caps have dice on them for decoration. The history of the bicycle is apparently it was owned by the son of the brother of Enrique Iglesias and it was kept outside so hence the minor surface rust. We have a black basket that we have to get from his apartment and strap it to the rack with zipties. He rode it to the Tri Rail today to go to the Lake Worth main campus of Palm Beach State College to finally register for classes and he loved it. One day now we will take both of our dutch bikes on the train and make a ride to either Hollywood Beach again or South Beach to his uncle's. Our inaugural ride was last night and tonight we took the bikes again and did a Publix foodstore run :) and I again strapped paper towels to my rack.